I explained that Jews traditionally prostrate themselves only once a year on the High Holidays. But it’s interesting question that I’ve never really stopped to ponder: why is prostration is so relatively rare in Judaism as opposed to Islamic or Christian tradition? Kneeling and prostration is actually quite common in the Torah (where it is not at all uncommon for major characters tend to “fall on their faces” before God) but it was never universally embraced as a regular practice by rabbinical authorities. With the notable exception of Maimonides, most medieval Jewish authorities discouraged regular kneeling/prostration during the Middle Ages – most likely in order to differentiate Judaism from Christianity and Islam. While bowing from the knees is common in Ashkenazic Jewish tradition (i.e. in the daily Amidah or Aleinu prayers) kneeling or full prostration occurs only during Rosh Hanshanah Musaf and Yom Kippur Avodah services – and then only among more observant Jews. With the current growth of Jewish yoga, it’s somewhat inevitable that we’re now witnessing prostration being reconsidered in new ways. (Just a cursory web search, for instance, reveals the work of Daniel Gigi, who seems to have developed an extensive synthesis of yoga and Jewish mysticism, including a technique he calls the “13 Point Prostration.”) I still remember well that two years ago, during JRC’s observance of the once-in-twenty-eight-years celebration of Birkat Hachamah, we held a wonderful service that combined sunrise meditations, yoga sun salutations and traditional Jewish prayers. Our cantor and I perform the High Holiday service prostrations ourselves (but for obvious reasons we never really know how many congregants follow our example). For myself, I find something enormously powerful about the physicality of bowing down to the floor. It is truly the most universally humbling of gestures – a simple yet profound way to emptying one’s ego and acknowledge the presence in the universe of a power greater than oneself. your writing gave me the “permission” i may have been unconsciously seeking. i greeted the day with childs pose while meditating on the first 2 words of modeh ani. dizzying light. thank you. The prostration during the Great Aleinu is one of my favorite moments of the year. I always wish it could last longer. It’s incredibly powerful. 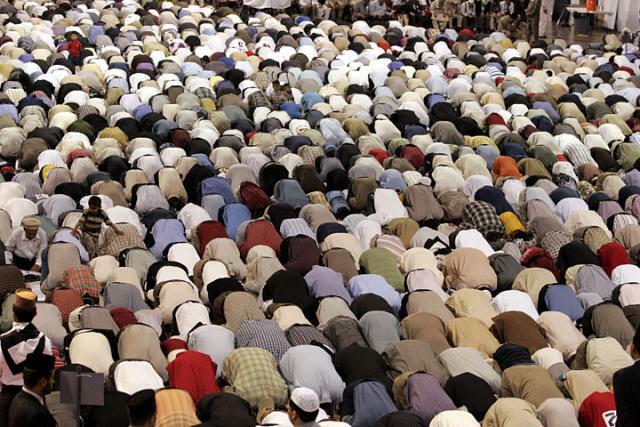 There are Jews, the Karaites for example, who practice regular prayer with full prostration kneeling on a rug just like Muslims do. Not to imitate Christianity or Islam as you think but because in terms of purity requirements, they view their synagogues as the replication of the Temple where the Cohanim used to fully prostrate while reciting certain prayers accompanying the sacrifice. Rabbinic Judaism ceased the prostration with the cessation of the sacrifice in the first century c.e. and does not view the synagogue as replacing the Temple. No Temple, no sacrifice, no prostration. In the same spirit, the Samaritans pray on a rug and prostrate because they still have their sacred mount Grizim which thy believe to be the site of the first Temple.